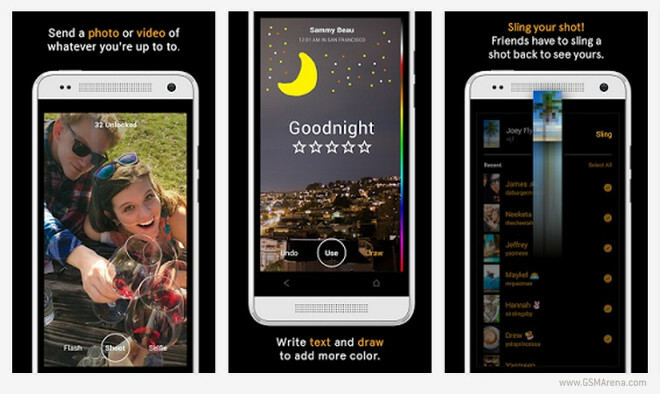 After having failed to outright buy Snapchat last year, Facebook has now released Slingshot, a new app that aims to compete with it. Slingshot is available to download for Android and iOS, but it comes with a pretty strange twist. Like Snapchat, Slingshot lets you quickly share pictures and videos with your friends – and these disappear forever once they’ve been swiped away in the app. But here’s the catch: when you receive something in Slingshot, before you are able to view what’s been shared with you, you have to first send something back to that person. So you can only see a photo someone sends you after you’ve sent that person a photo back. Thankfully though, you can also send a quick reply with your reaction after you’ve finally seen what was sent to you. The app allows for captions and drawings to be added to what you’re sharing, which should appeal to the artistically inclined. ‘Slinging’ to multiple friends at once is possible too, obviously.